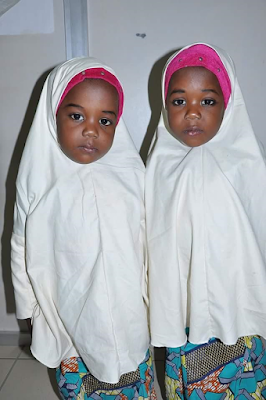 Beautiful conjoined twins Hassana and Hussaina who were born in Kano in 2013 and later separated in India now suffer serious complications and Five million naira to rectify what they are currently going through. 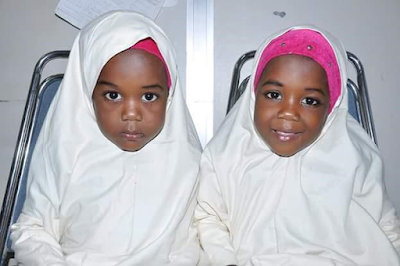 'This set of beautiful twins born conjoined in 2013 at Murtala Muhammed Specialist Hospital Kano later transferred to Aminu Kano Teaching Hospital, Kano. The twins were later moved to India for separation, four years after the separation they are now experiencing a very serious complication that required the sum of Five million naira (N5,000,000:00) at the Hospital where they were separated. Hassana and Hussaina suffer uncontrolled defecation and urination which they have to wear diapers constantly to contain the frequent leakage of faces and urine. This uncomfortable situation deprived them from interaction with other children both at home and in school. The parents in collaboration with Medical Social Work Department Aminu Kano Teaching Hospital, Kano are appealing to the general public to please donate for the treatment of the twins. All donations should be channel to Aminu Kano Teaching Hospital or contact Head of Department Medical Social Work through these GSM 08065580007/08023088964 Please donate, a drop can make an ocean, pass on'.